In a way their absence of any damping adjusters is liberating, particularly at trackdays. This is an uncluttered motorcycle with a heart of gold and a straightforward attack plan: just get on with it, idiot, it seems to say. Turn the tthrottle; have fun. Some days, though I do wish its WP suspension was less basic. On my fast and bumpy road to work there’s not enough support at the front or consistent control at the rear. The 790 overreacts to bumps, stands itself up in dips, wiggles its bars if I accelerate hard over a broken surface and occasionally threatens worse. A slightly squidgy seat makes for mild numbing after 150 miles, but the riding position leans you just-so against a 70-80mph breeze, especially with the bars set in their forward mounts. Barely any engine heat reaches your legs while the LC8c is liquid smooth for a parallel twin. So no real complaints. Mainly I feel poised. No, it has been faultless so far with no engine oil used either. A heavily oxidised exhaust recovered its finish after 30 minutes of intense rubbing with Autosol. One niggle is a strange, mousy-squeak that emanates from the drivetrain. Two other 790s I’ve ridden both do it, and lubing the chain quietens things a little. The LC8c is the most flexible and free-revving parallel-twin I’ve ridden. It’s gruff and torquey at low rpm then seems to grow a third cylinder as it spins towards its redline. The fuelling’s abrupt when you pick up a closed throttle and spiky and Euro4-lean on a constant throttle -- but you get used to it. It’s slim, smooth and handsome, too, and gives me 60mpg every day of the week. Some days it’s all about getting me into work asap. It’s a parallel twin, of course, but an aggressively thin one, with wickedly light steering and nonchalant walking-pace balance – and good for at least 60mpg, no matter how badly it’s ridden. The drive is a bit juddery, as all twins can be at low road speeds, while throttle response is irritatingly abrupt just when it needs to be smooth. But the 790 is a flowing and commanding commuter that will even hop up a kerb when all other options are closed. It’s not only efficient but cheeky too. So it’s all about the commute then? Yes and no. I’m growing increasingly frustrated by its bog basic WP suspension, which needs much more control on bumpy roads, but in all other respects the 790 is the perfect bike for a country thrasher like me. The magic ingredient is that new LC8c motor, which pops and gurgles smoothly – and makes the bike fly. Ignore relatively humble output figures; it has enough low down shove and free-revving top end power to make rural riding a dream. It’s neither intimidating as some bigger bikes can be nor slightly worthy like many other parallel twins. Just fun. Ah, so it’s all about an old fashioned thrashing? Not completely. There is also a neat TFT dash, and within it a bundle of very modern options: front wheel-only ABS, wheelie control, launch control and a lovely full-fat track setting that makes the engine feel lumpier and mightier. So while the 790 is quite basic in some departments, it does have an easy to understand menu of electronic toys. It wants to play. They’re only a part of it. As is the way it combines gentle road manners with the ability to sit high and thunder past everything like it’s a 1290 Super Duke R, and bounce off kerbs at trackdays, refusing to be outmuscled by proper track bikes. So back at the office printer, it’s time for a proper answer. Yes, the 790 Duke is agile, frugal, sporty and extremely versatile. But what it’s actually all about – what infuses every inch of its ride – is its up-for-it attitude. Wherever it is and whatever it does, it just loves being a motorcycle. It must have been ten laps into the trackday when I realised something a bit special was happening. And that was that, despite riding a relatively humble parallel twin with only half the power of a modern superbike, I was having a ball - more furious fun than I managed at the same circuit on a Honda Fireblade SP just a few months before. It’s true. The 790 Duke can change direction faster, brake later and - on a pair of sticky Metzeler Racetec K3s - lean further than any other bike you can ride out of a showroom, certainly that I can think of. What it lacks in brute force it makes up for with an easy-going lightness and a contagious sense of fun. It takes nothing, least of all riding round as fast you can in circles, too seriously and using its blistering corner speed cheekily places itself in the way of more serious bikes for as long as it can. There’s just enough damping, immense feel and a neat package of electronics to help you maximise braking, lean, traction, bravery… everything. I don’t want to get carried away here. It would be swamped by the Blade and its bigger boy chums away from the torturous infield at Rockingham, whose hairpins and second gear corners are made for a light and torquey middleweight, but the 790 made its point. All this was on day two of my tenure of the 790, and early impressions are that it’s a ruthless commuter, too. It’s ultra-slim like a single, so you ride with your knees all but touching, tucked in tight, and feel happy to point it at gaps so narrow you instinctively breathe in. Then it digs into roundabouts and clears off sharpish. There are a couple of early misses, too. 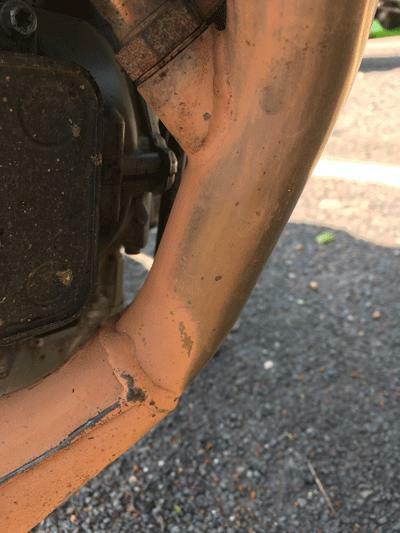 The fuelling is abrupt and spiky at low rpm, making it hard to be smooth on a constant or off-to-on throttle, while my bike's exhaust is already as orange as its tank, something I would be pointing out to my dealer were it mine.